More fun back on Highway One.. 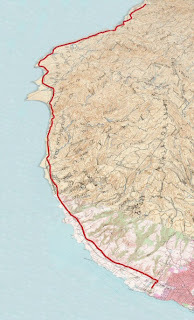 This weekends Captain's Ride with the Ironteam, started at Natural Bridges in Santa Cruz with a 90 mile route straight up Highway One with a turn around in Half Moon Bay. The weather was the oposite end of the extreme from last weekend's ride at Lake Berryessa. When preparing for the ride I decided to put on an extra layer, a wise clothing choice for once. We started out the ride just after 8am and headed north into the wind, the head wind was not as bad as it had been on previous occasions. I was out on my Tri-bike and made full use of it's aerodynamic capabilities. There was light drizzle and clouds were darker the further north I went, although the weather was more refresh than disruptive. I kept a good a pace going maintaining an average of 18mph before turning around at Half Moon Bay. On the way back I felt I was slowing down, though the help of a tail wind I managed to get a negative split on the way back. The ride was followed by a short run to train the legs for the bike to run transition.